Jill Of All Trades: How Croma Electronics Made a Fool out of an Armin Van Buuren fan. How Croma Electronics Made a Fool out of an Armin Van Buuren fan. I am writing this blog because @cromaretail made no effort to respond to @koshik_sash 's tweets & DMs. Croma hosted a Twitter contest on 22nd January that went on for 2 days. 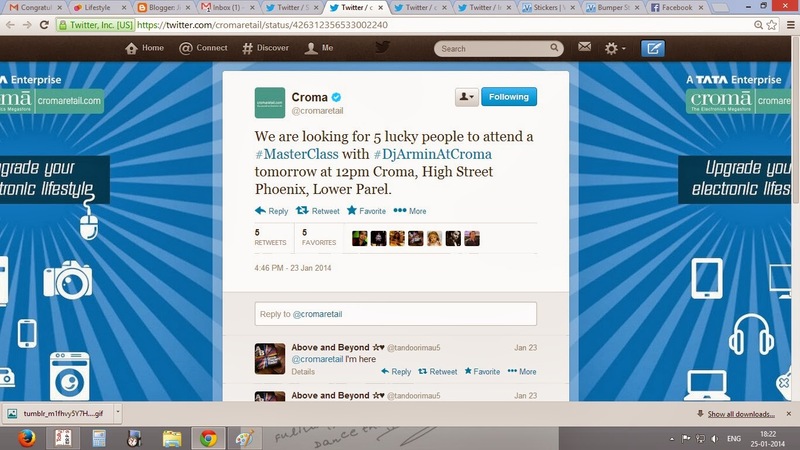 According to what they stated, 5 lucky winners were to get to attend a #masterclass with Dj Armin Van Buuren at the Croma Store, Grand Galleria, High Street Phoenix, Lower Parel, Mumbai at 12 noon on 24th January 2014. The same day that Armin had his #Intense Gig at NCPA. He was sent DMs from Croma's twitter account, first asking for his details like Name, Age, Contact No., Email ID, Address. And then around midnight was told to be present at Croma Store at 11:45am. They also gave a contact no. for Mr. Lal, whom Koshik was to contact on reaching the venue. I am not uploading screenshots of the DMs because they contain sensitive information. So, Koshik, who is a DJ himself and an aspiring sound production enthusiast, excitedly goes to Croma, Lower Parel at the given date and time. He travelled all the way from Kharghar, Navi Mumbai to Lower Parel for this. I went along, because being a Armin Van Buuren fan, I wanted to see him too, though I was not sure if I would be allowed to. Since they had hosted contests and stuff. At the venue, Armin Van Buuren arrived at around 12:15. He was welcomed, he spoke a little, unveiled and launched the Philips product that he was here to launch. Then the anchor announced that 10 lucky winners from digital contests would get to "meet n greet" him. 10 names were announced, these lucky ones got to click pics with Armin, take autographs etc. Koshik's name was not on this list. This got me wondering and thinking that something is fishy. I asked a security guy next to me what happens next. He said, nothing, Armin shall be leaving. And just like he said, once this was done, Armin Van Buuren made a quick leave, ofcourse, he must be wanting to rest before his gig at evening. I was left in shock. Forget a #masterclass, Koshik was not even selected to meet Armin personally. I approached Mr. Lal, a person in charge wearing a red checkered shirt and specks, and explained the whole scenario to him. Do you know what he replied? He said, that Koshik got a chance to see Armin so up close and launch a product, that is what the contest prize was. THAT IS SO DAMN RIDICULOUS. I did not play any contest, other customers present at Croma that day did not play any contest, but we also got to see Armin. So then, whats the difference between a prize winner and a normal customer? Why were they lied to? Why such a big deception in the name of a contest? Making yourself look all good in front of the followers. We tweeted to Croma's handle, expecting and awaiting a reply, some sort of apology or explanation. But none given till now. Koshik sent some 15 tweets over the 2 day period of the contest, and was really looking forward to this event. I am sorry Croma, and Tata Enterprise, but this was just not done. We accept the apology, but the time wasted and the disappointed experienced cannot be reimbursed. Shall be left with a negative image of Croma. IskiUski is one of the online foremost jewellery shop in india with the latest jewellery design in Gold, Diamond, Silver. We offer wide range of online gold earrings from various famous designers.